This year has been a busy one here at HeadRed, and as it begins to draw to a close we thought this would be a good opportunity to introduce our 3 sparkly new SEO team members who promise to make the coming year even more exciting and successful here at HeadRed HQ with the skills each of them bring to the team. As SEO Manager, Aman is key in the development of the SEO department as he takes responsibility for team management and operational procedures. Aman brings to HeadRed his impressive technical experience of managing SEO campaigns for big brands such as Tesco Bank and Three Mobile, having worked for a couple of agencies in London previously. He has recently returned to the quieter life in Warwickshire to be closer to family and enjoy having more space and a garden! I’ve been in the industry for about 5 years now. The landscape has changed quite dramatically since I first got into SEO and continues to evolve every day, although I still love it as much as I did then. SEO entails a much broader spectrum now, which is why it’s important for SEO’s to understand all aspects of digital marketing and how they fit into the wider picture. What do you enjoy most about SEO? I certainly enjoy the more technical aspects of SEO, I love digging deep and uncovering issues under the hood which can help clients see almost instant improvement in their search visibility. The biggest rush for me has to be seeing increases in ranking’s for high volume / high converting terms where we’ve built up authority for a given page over time – seeing the overnight uplift in traffic and conversions off the back of this is great news I love delivering to clients. Where would we be most likely to find you on a Saturday night? Most probably in my local pub enjoying a pint of Curious Brew, if you haven’t tried it – I urge you to check it out, made of champagne yeast it’s one of the cleanest tasting beers I’ve ever had. Living up to his name, Will certainly has a wealth of SEO experience, particular in e-commerce where he has a proven record of achieving regal results for past websites he has worked on including find-me-a-gift.co.uk and Karndean. As SEO Account Manager at HeadRed, Will is focussing on bringing e-commerce clients more riches through his magical powers that can turn keyword research into dollar. How long have you been in online marketing? I got my first job in online marketing about 6 years ago when I took a website support position for a property search website. This involved all aspects of online marketing and is where I learned the basics. Then as my career progressed there, my role became more and more SEO focused. Since then, I’ve worked in different online marketing positions in varied niches, ranging from luxury brands to online gift retailers. What do you love about SEO/Online marketing? SEO is a results driven industry and one of my favourite parts of this business is definitely seeing the results of our hard work come to fruition. Watching rankings rise, traffic increase, and conversion rates grow is definitely the best bit for me. I don’t think you can ever get bored working in SEO. It’s an ever changing industry, and what works today may not work tomorrow. So just keeping up with the challenges search engines throw at us is a massive motivation for me. If you could pick any superpower, what would it be? It would have to be the powers of a Jedi Knight. I like the idea of being able to move things without touching them, and using Jedi mind tricks to get my own way. 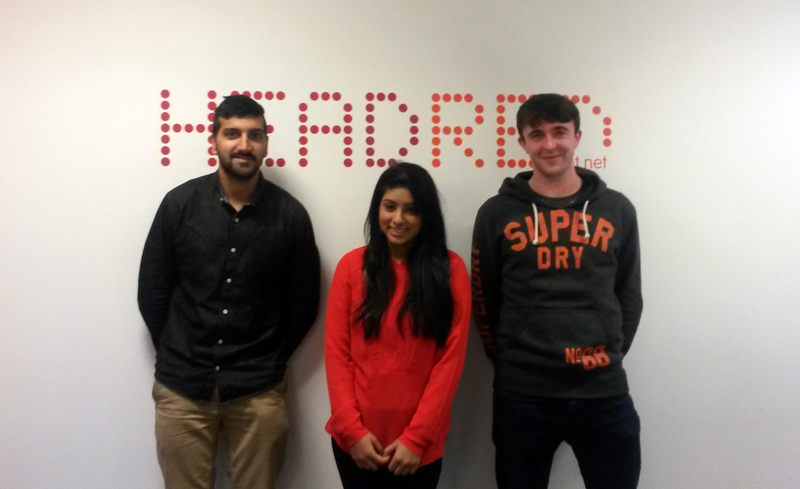 We are delighted to support Kanika in her studies with this placement at HeadRed. Her previous experience of marketing through volunteer and part-time work, along with her decision to gain work experience within a digital marketing agency has shown us that she’s driven to learn and become the best at what she does. With a keen interest in design and visual creativity, Kanika has more involvement in our social media and content marketing, as well as supporting the rest of the team with SEO and PPC tasks to further strengthen her overall knowledge of the industry. What brings you to HeadRed? I am a student at De Montfort University studying Digital Marketing and Social Media, where I have just finished my second year in my degree at a 2:1. I am currently taking on a placement year here at HeadRed. At HeadRed I feel I can develop my marketing skills as well as gaining a full insight in the digital marketing platform. The reason why I chose to do this degree is because I feel that marketing day by day is growing towards online marketing and digital marketing is the future for any product or services marketing. What’s your favourite area of online marketing? Online marketing means the selling of products/services over digital platforms like internet and cellular phone networks. There are many different areas in online marketing; social media, local SEO, PPC, email marketing, blogging etc and my favourite areas are social media and email marketing. Basically because I like creating social content which enables me to express my creativity visually and verbally. As having a indian ethnicity I love to eat an italian cuisine. My favorite dish is pasta, and red sauce which is made up with peppers, celery, onions, and tomatoes grinded and cooked together. Seasoned on top with black pepper and basil.